L.A. landscape designer Judy Kameon liberates herbs and other edible plants from the kitchen garden and uses them to create stunning outdoor spaces. Judy Kameon thinks herbs can be as pretty as flowers. Her Los Angeles firm, Elysian Landscapes, is known for combining edible and ornamental plants in striking designs for such clients as director Sofia Coppola and the Parker Palm Springs hotel. 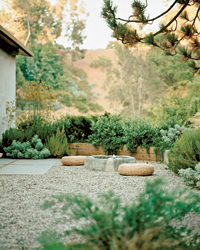 Here, Kameon shares tips for creating gorgeous outdoor spaces (elysianlandscapes.com). Choose herbs for fragrance and beauty. “I love to use berggarten sage, also known as purple sage, which has nice gray foliage and a beautiful blue flower,” Kameon says. Another one of her favorite herbs is trailing rosemary, which has a lovely fragrance and looks pretty on hillsides. Kameon likes to place mint under citrus trees. “The combination is like a fresh mojito kit,” she says. Since mint spreads so quickly, she keeps it in pots to prevent it from taking over an outdoor space. Use thyme as ground cover. “I often plant thyme along walkways, between pavers, since it’s tough and grows quickly,” Kameon says. She uses as many as five varieties of thyme. French thyme is her preference for cooking, but she also appreciates the subtle citrus flavor of lemon thyme and the dramatic, chartreusey green color of lime thyme. “With a lot of herbs, the more you clip, the more they grow,” Kameon says. “If you want great-looking thyme, the best thing to do is to use it.” Cut sprigs from different sections of the plant, she advises, or it will grow unevenly. Kameon pairs lemongrass with succulent plants: “Lemongrass is so animated and succulents are so static.” In the kitchen, she uses it in herbal teas (tisanes) and Thai dishes. Decorate a great landscape with fabulous outdoor furniture. In April, Kameon opened an L.A. showroom for her outdoor furniture line, Plain Air, where she displays less common items like ottomans, nesting tables and what she describes as “oil-paper umbrellas that look like they belong in a giant cocktail” (213-380-3185 or plainair.com).